Beyond Coworking analyzed the programmatic characteristics of visually compelling and financially feasible co-working environments, and then applied these elements on the full-building scale, creating an alternative to spec suites for growing tenants. Why Beyond Coworking? : Emergent Research claims that by 2020 3.8 million professionals will work in co-working facilities, and CBRE states that Co-working tenants accounted for 20% of leases signed in Q1 2016, with an expected growth rate of 20%+. Detecting growing demand for co-working spaces, this investigation sought to determine the design characteristics of space that are credited with sparking ideas for their entrepreneurial occupants, opportunities to improve the model, and projections about how co-working would impact the future of workplace design. 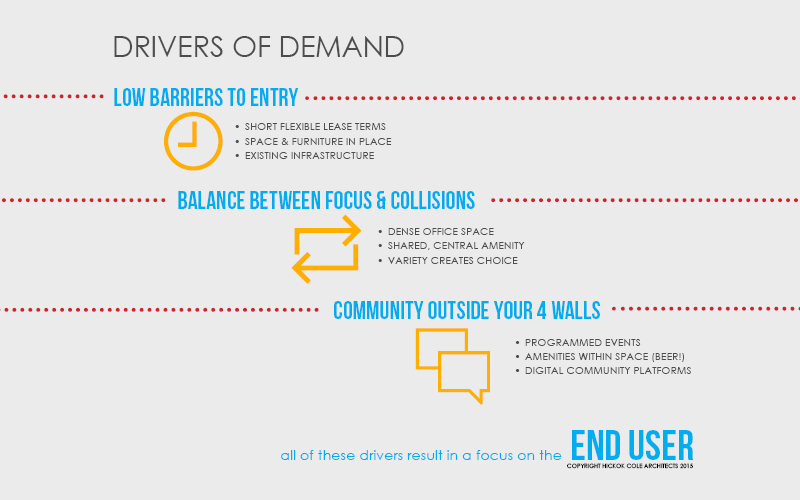 Process: After conducting interviews and co-working space tours of 3 of DC’s largest operators, we analyzed the plans of each to determine average space allocation ratios and square footage. We determined the design drivers and operational best practices of successful co-working spaces, and then applied the best elements of co-working to the full building scale, arriving upon the “Curated Building Environment” model. What We Found and Why it Matters: The ratio of closed offices to benching offices was higher than expected, and an enhanced property management model led to a culture of collaboration balanced by business-focused concentration-centric design decisions. 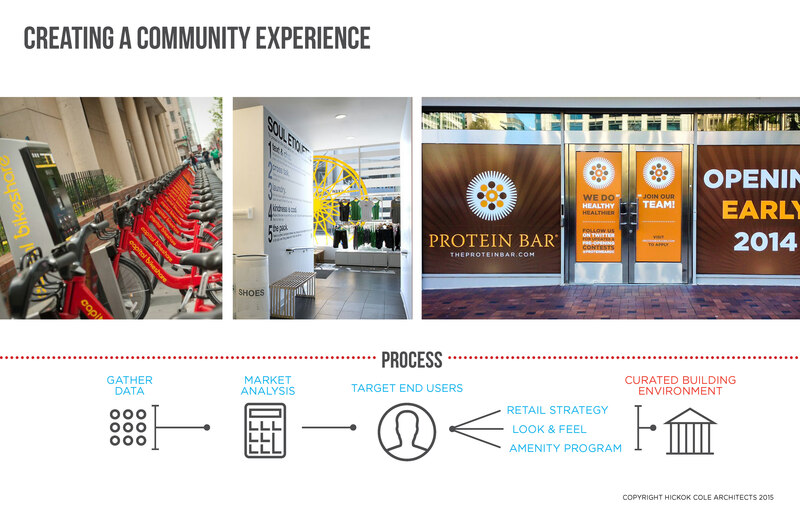 We identified a middle market opportunity, “Curated Building Environments”, that has impacted our design approach to building amenities and office interiors alike. What’s Next? : We continue to study the evolution of co-working and apply best practices from this exploration to our coworking operator clients, spec office buildings and corporate clients, resulting in buildings designed to maximize occupants’ productivity by providing abundant spatial variety and collision opportunities.